The graph shows a large difference in water table depth (in meters) simulated by ALM and ParFlow. Topography and lateral flow have major control on water available to plants. The Amazon basin has experienced periodic droughts in the past, and intense, more frequent droughts are predicted. Comparing hydrologic models of different complexities and parameters in a catchment in central Amazonia, a research team led by scientists at the U.S. Department of Energy’s (DOE) Pacific Northwest National Laboratory found that variations in terrain have a dominant influence on groundwater table and streamflow through lateral transport of soil water. Hence, different models produce significantly different water available to plants. Despite the difference, however, plants were not under water stress in any simulation, even during a drought year. The team identified another important process—the efficiency of water transport through the plants—which must be better represented in models to more realistically simulate drought response. Tropical forests are an important carbon sink, but a large fraction of the carbon sequestered during normal and wet years can be released during drought years because of tree mortality and reduced ecosystem productivity. This research shed light on key processes that influence water available for plant use, and provided insights for improving modeling of tropical forest drought response. To better understand how tropical forests respond to drought requires improved capabilities to predict the spatial variability of water and soil moisture available for plant use. Researchers in the United States and Brazil identified spatial variabilities in soil and topography as the dominant influences on soil hydrology in an Amazonian catchment. 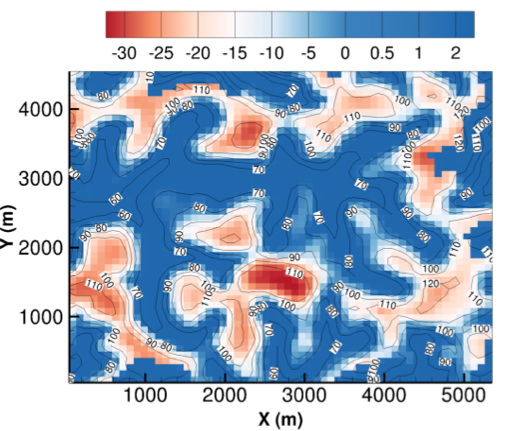 Scientists performed a series of numerical experiments using the one-dimensional DOE Accelerated Climate Modeling for Energy (ACME) Land Model (ALM) and the three-dimensional ParFlow hydrology model. Researchers found large differences in groundwater table depth between the models. By varying the model soil parameters, the team found that ALM can reproduce the long-term mean groundwater table depth simulated by ParFlow, but it cannot capture features such as delayed groundwater recharge at the plateau. This study showed that developing approaches to represent lateral processes that are missing in one-dimensional models is critical for modeling water available to plants in tropical forests. In addition, plant hydraulics (the efficiency of water transport through plants) and preferential flow (water movement through macropore soils) are key processes that should be represented in Earth system models for simulating tropical forest response to drought and the future of the land carbon sink. The results could apply to other catchments in the Amazon basin with similar seasonal variability and hydrologic regimes. Leung, L. 2017. "Influence of landscape heterogeneity on water available to tropical forests in an Amazonian catchment and implications for modeling drought response." Journal of Geophysical Research: Atmospheres 122(16): 8410-8426, doi:10.1002/2017jd027066. The U.S. Department of Energy Office of Science, Biological and Environmental Research supported this research as part of the Terrestrial Ecosystem Science program through the Next Generation Ecosystem Experiment (NGEE)-Tropics project.